Little is known about the life of the man known as Theophanes the Greek, a Byzantine artist who came to Russia in the 14th century. Yet although few of his church frescoes remain, the cultural legacy left behind by the painter is immense: He created his own school of icon painting, was mentor to Russia’s greatest icon painter Andrei Rublev, and is believed to have illustrated rare medieval texts. Until the 17th century, Russian painting was exclusively religious and predominantly anonymous. In medieval Russia, an artist really needed to have outstanding abilities in order to be remembered in the chronicles and leave his mark in art history. The history of ancient Russian icon painting has preserved two great names: Andrei Rublev and Theophanes the Greek. In Russia, icon painter Theophanes was nicknamed "the Greek" because of his Byzantine origins (in the medieval era the Byzantine church was referred to in Russia as "Greek"). The information we have on Theophanes is vague: Neither his birthdate nor the date of his death is known, nor is the place where he was buried, nor the reason why he came to Russia. The chronicles refer to him superficially four times: in 1377 (he "signs" the Church of the Transfiguration on Ilyina Street), in 1395 (he paints, along with his students, the Church of the Nativity of the Theotokos in Moscow), in 1399 (he works in the Moscow Cathedral of the Archangel) and in 1405 (together with Andrei Rublev and Prokhor of Gorodets he paints the Cathedral of the Annunciation of the Moscow Kremlin, creating an iconostasis for it). The principal source of information about Theophanes is a letter written by famous Russian hagiographer Epiphanius the Wise, a contemporary of Theophanes, to his friend St. Cyril of Beloozero in 1413. In the letter, Epiphanius confirms that before arriving in Russia, Theophanes had painted many churches "in Constantine’s city (Constantinople) and in Chalcedon (in modern-day Turkey), and in Caffa (today's Feodosia in Crimea). Apparently, Theophanes, already a famous artist, decided to abandon Byzantium because in the second half of the 14th century the decrepit empire, attacked by the Turks from all sides, was entering a crisis, which soon resulted in the fall of Constantinople. It was common practice to invite icon painters from Byzantium to paint Russian churches. For example, chroniclers refer to a certain Isaac the Greek, who half a century before Theophanes had painted one of the churches of Novgorod, one of Russia’s oldest cities. According to Epiphanius the Wise, Theophanes the Greek was incredibly prolific. In his life he worked in at least 40 churches, yet out of his icons and frescoes only the works in the Church of the Transfiguration on Ilyina Street in Novgorod and the iconostasis of the Cathedral of the Annunciation in the Moscow Kremlin have been preserved. But this is enough to understand why the icon painter became so renowned. Theophanes transplanted a completely different icon painting tradition to Russian soil. His style is quick, passionate and almost schematic, drastically contrasting with the soft and well-developed figures of pacific saints that we see on icons from the Russian school. It had a strong, emotional impact on the viewer. Epiphanius the Wise was deeply impressed by the way Theophanes worked: "When he would draw or paint no one saw him looking at the models, as some of our icon painters do, those who out of dullness constantly peer at the models, moving their eyes from here to there, and in the end are not really painting, but are just looking at the models. “Theophanes, on the other hand, paints the images with his hands, while constantly walking around, speaking with visitors, but with his mind reflecting on the lofty and the wise, seeing the intelligent goodness with his sharp intelligent eyes." Theophanes practiced hesychasm, a Christian exercise involving asceticism, immersion in oneself, the union with God inside oneself and the knowledge of God - that is, in modern language, meditation. He believed that the icon's emotional impact was capable of facilitating this process. However, Theophanes the Greek's God does not resemble the one on the icon reflecting the Russian Orthodox worldview. One of the icon painter's greatest works, preserved to this day - the fresco of the bust of Christ Pantocrator in the cupola of the church on Ilyina Street - depicts Christ full of righteous anger, which he is ready to cast upon any sinner. Austerity is the main trait of Theophanes' icons. They have no warmth or calm, qualities that characterize Rublev's painting. Theophanes' favorite figures are menacing Stylite and Eremite priests who are immersed in themselves. 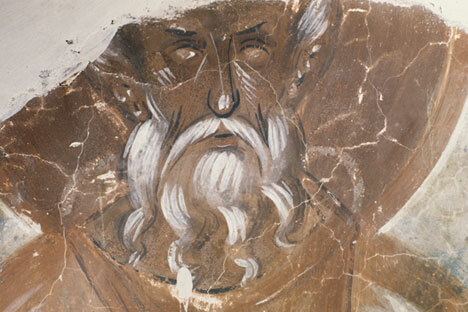 Many well-known works are attributed to Theophanes the Greek – both icons and frescoes. These include the famous icon Our Lady of the Don, in front of which, according to tradition, Dmitry Donskoy prayed before the Battle of Kulikovo. It is now kept in the Tretyakov Gallery in Moscow. The painter is also the presumed author of the Dormition of the Mother of God (1380) and the Transfiguration of Jesus (1408) icons. Theophanes worked not only with church commissions, but also with private ones. He turned out to be an excellent illustrator and miniaturist. He is also the presumed designer of one of the masterpieces of medieval book publishing: the Gospel of the Boyar Fyodor Koshki. Each chapter is decorated with imaginative ornaments and begins with initials that resemble various animals. Despite the fact that the majority of Theophanes' works have not survived, his influence on Russian culture was immense. He created his own school of icon painting, which instructed many talented masters. He was Andrei Rublev's teacher and mentor. And he was the first in Russian history to place life-size figures of saints in an iconostasis – in the Cathedral of the Annunciation of the Moscow Kremlin.